Back in February I had the opportunity to present “Enabling the Next Generation of Apps with IBM MobileFirst” at the DevNexus developer conference in Atlanta. It was a great event, packed with lots of useful content. Luckily for everyone who wasn’t able to attend, the organizers recorded most of the sessions – which have just been made available on Youtube. In my presentation I introduce both the MobileFirst Platform Foundation Server and MobileFirst services on IBM Bluemix to enable mobile applications. The video is available below. In it I cover remote logging, operational analytics, exposing & delivering data, managing push notifications, and more. Both the platform server and cloud solutions are free to try and enable developers to deliver more from their mobile apps more efficiently and more securely. Here’s the session Description: Once your app goes live in the app store you will have just entered into an iterative cycle of updates, improvements, and releases. Each successively building on features (and defects) from previous versions. IBM MobileFirst Foundation gives you the tools you need to manage every aspect of this cycle, so you can deliver the best possible product to your end user. In this session, we’ll cover the process of integrating a native iOS application with IBM MobileFirst Foundation to leverage all of the capabilities the platform has to offer. Update: The IBM Watson team just announced a new native SDK for both iOS and Android that simplifies and streamlines integration with Speech To Text and Text To Speech services. Check out more detail here: IBM Watson Speech Services Just Got A Whole Lot Easier. Using your voice to drive interactions within your app is a powerful concept. It is the primary interaction driving Apple’s Siri, Microsoft’s Cortana, and Google’s Voice Actions. By analyzing spoken words, voice commands allow you to complete possibly complex actions with minimal interaction with the device. Or, they enable entirely different forms of interaction, for example, interacting with a remote system through the telephone. If you think that voice-driven apps are too complicated, or out of your reach, then I have great news for you: They are not! Last week, IBM elevated several IBM Watson voice services from Beta to General Availability – that means you can use them reliably in your own systems too! Part one of this equation is converting the audible signal into text that can be parsed and acted upon. The IBM Speech to Text service fits this bill perfectly, and can be called from any app platform that supports REST services… which means just about anything. It could be from the browser, it could be from the desktop, and it could be from a native mobile app. The Watson STT service is very easy to use, you simply post a request to the REST API containing an audio file, and the service will return to you a text transcript based upon what it is able to analyze from the audio file. With this API you don’t have to worry about any of the transcription actions on your own – no concern for accents, etc… Let Watson do the heavy lifting for you. This one is perhaps not quite as simple because it is entirely subjective, and depends upon what you/your app is trying to do. You can parse the text transcript on your own, searching for actionable keywords, or you can leverage something like the IBM Watson Q&A service, which enables natural language search queries to Watson data corpora. Riding on the heels of the Watson language services promotion, I put together a sample application that enables a voice-driven app experience on the iPhone, powered by both the Speech To Text and Watson Question & Answer services, and have made the mobile app and Node.js middleware source code available on github. 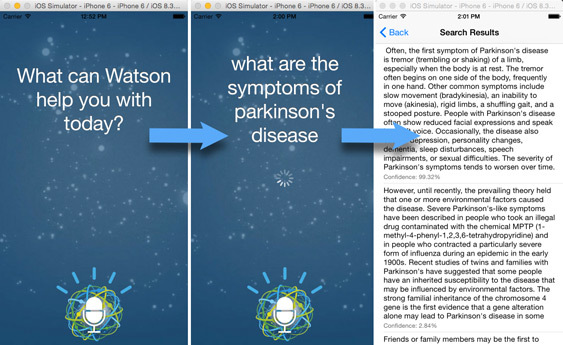 This native iOS app, which I’m calling “Watson Speech QA for iOS” allows you to ask Watson questions in natural, spoken language, and receive textual responses based on the Watson QA Healthcare data set. 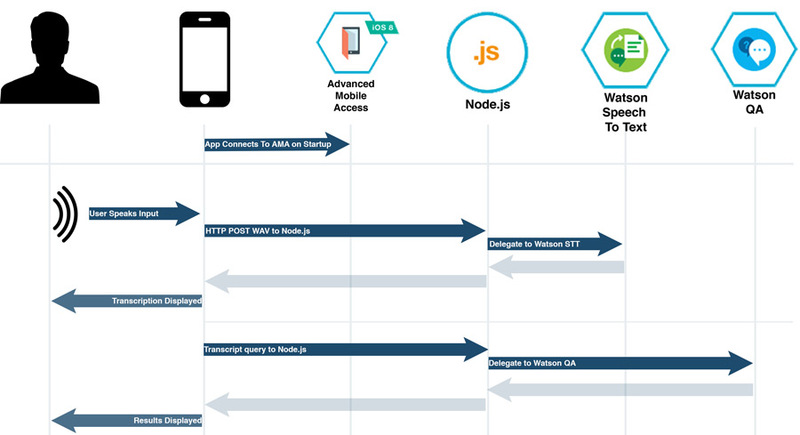 The app communicates to the Speech to Text and Question & Answer services through the Node.js middelware tier, and connects directly to the Advanced Mobile Access service to provide operational analytics (usage, devices, network utilization) and remote log collection from the client app on the mobile devices. For the Speech To Text service, the app records audio from the local device, and sends a WAV file to the Node.js in a HTTP post request. The Node.js tier then delegates to the Speech To Text service to provide transcription capabilities. The Node.js tier then formats the respons JSON object and returns the query to the mobile app. For the QA service, the app makes an HTTP GET request (containing the query string) to the Node.js server, which delegates to the Watson QA natural language processing service to return search results. The Node.js tier then formats the respons JSON object and returns the query to the mobile app. The code for this example is really in 2 main areas: The client side integration in the mobile app (Objective-C, but could also be done in Swift), and the application server/middleware implemented in Node.js. The credentials come from your Bluemix environment configuration, then you just create instances of whichever services that you want to consume. Note: I am using the free/open Watson Healthcare data set. However the Watson QA service can handle other data sets – these require an engagement with IBM to train the Watson service to understand the desired data sets. On the mobile side we’re working with a native iOS application. My code is written in Objective C, however you could also implement this using Swift. I won’t go into complete line-by-line code here for the sake of brevity, but you can access the client side code in the ViewController.m file. In particular, this is within the postToServer and requestQA methods. The native mobile app first captures audio input from device’s microphone. This is then sent to the Node.js server’s /transcribe method as an attachment to a HTTP POST request (postToServer method on line 191). On the server side this delegates to the Speech To Test service as described above. Once the result is received on the client, the transcribed text is displayed in the UI and then a request is made to the QA service. In the requestQA method, the mobile app makes a HTTP GET request to the Node.js app’s /ask method (as shown on line 257). The Node.js app delegates to the Watson QA service as shown above. Once the results are returned to the client they are displayed within a standard UITableView in the native app. Within AppDelegate.m you will see calls to IMFClient, IMFAnalytics, and OCLogger classes. These enable operational analytics and log collection within the Advanced MobileAccess service. IMFResourceRequest class. Using the IMFResourceRequest class enables the collection of analytics for every request made within the application (through this class). 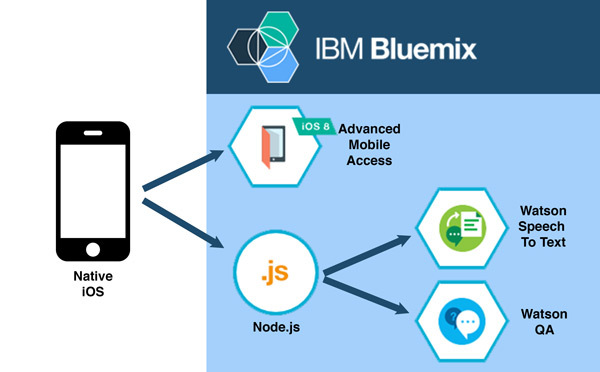 Together these allow for the collection of device logs, automatic crash reporting, and operational analytics that provide one of the strengths of the Advanced Mobile Access service, which is one of the mobile offerings on IBM Bluemix. Just create an account on IBM Bluemix, and you have everything that you need to get started creating your own voice-driven apps.